Reference number for this case: 7-oct-54-Bompas. Thank you for including this reference number in any correspondence with me regarding this case. In the night of Saturday to Sunday, a baker of Bompas, Eastern Pyrenees. Mr. Sebelli [or Sibelli] saw, posed in a street of this village an object in the shape of a cigar of approximately two meters length, surrounded by curly gleams. Mr. Sibelli [or Sebelli] awoke neighbors who attended the fast departure of the machine. Jimmy Guieu indicates that on October 10, 1954, in the night, a baker of Bompas in the Pyrenees Orientales saw a spindle-shaped machine posed in a street of the village. The amazed witness had called neighbors who whent at their windows and managed to see the miniature spacecraft taking off and leaving quickly, surrounded by iridescent gleams. Guieu comments that it was "very certainly" a reconnaissance device "radio-controlled from a mother-spacecraft moving in the upper atmosphere" and equipped "without doubt, of a televisionnor system", and said that logically more and more saucers should land in the towns in the future. Michel mentions the case as one of several aligned observations on this date but does not give additional information. Oct. 07, 1954, midnight, Bompas (France). The author indicates that on October 7, 1954, in Bompas, Mr. Sebelli saw an object landing in the village around midnight. He called his neighbors and they observed the departure of the aircraft. The two authors indicate that in Bompas in the Pyrenees-Orientales, on October 7, 1954, according to a dispatch by the A.F.P. and their personal files, a baker of the country, Mr. Sebelli, saw an object in the shape of a cigar, of approximately 2 meters length posed in a street of the village. The craft was surrounded by iridescent gleams. Mr. Sebelli awoke his neighbors and all witnessed the departure of the craft, which flew off almost immediately. The authors indicate that in Bompas on October 9, 1954, Mr. Sebelli found posed in a street of the village an object in the shape of a cigar, approximately two meters long, surrounded by curly gleams. He woke up neighbors who attended the fast departure of the apparatus. The authors indicate that the sources are case 21 of the Vallée catalogue, C. Garreau and R. Lavier in "Face aux E.T." page 172, and Le Figaro for October 13, 1954. A mysterious flying object was supposed to have made a brief landing in the village of Bompas, France, at midnight. A resident. M. Sebelli, saw the object touch down so he alerted his neighbors. A number of people gathered in time to see the object before it rose and made its departure. 78. 78. Paris, France. Paris-Presse. 13 October 54. Un mystérieux objet volant devait avoir fait un bref atterrissage dans le village de Bompas, en France, à minuit. Un habitant. M. Sebelli, a vu l'objet toucher le bas ainsi il a alerté ses voisins. Un certain nombre de personnes se sont réunies à temps pour voir l'objet avant qu'il ne se lève et fait son départ. 78. 78. Paris, France. Paris-Presse. 13 octobre 54. [lg1] "The Fifth Horseman of the Apocalypse - UFOs: A History - 1954 October", monography by Loren E. Gross, USA, pp 17-18, 1991. [lg1] "The Fifth Horseman of the Apocalypse - UFOs: A History - 1954 October", monographie par Loren E. Gross, USA, pp 17-18, 1991. Mr. Sebelli saw an object land in the village. He called his neighbors, and they observed the departure of the craft. 1954 - Mr. Sebelli saw an object land in the village of Bompas, France shortly before midnight. He called his neighbors, and they observed the departure of the craft. (Sources: Aime Michel, Flying Saucers and the Straight Line Mystery, p. 146; Jacques Vallee, Passport to Magonia, p. 220). Midnight - In Bompas (France), Mr. Sébelli sees an object land in the village. He calls his neighbors. They observe the departure of the craft together. Jérôme Beau indicates that his source is "Paris-Presse, Le Figaro, October 13, 1954". Luc Chastan indicates that in the Pyrenees Orientales in Bompas, on October 7, 1954, "a witness saw an object landing in the village. He called his neighbors. They observed the departure of the apparatus together." The website indicates that on 7 October 1954 at 24:00 in Bompas, France "Mr. Sebelli saw an object land in the village of Bompas, France shortly before midnight. He called his neighbors, and they observed the departure of the craft." The website adds: "An object was sighted that had an appearance and performance beyond the capability of known earthly aircraft. One object was observed by several male witnesses in a city." The sources are indicated as Guieu, Jimmy, Flying Saucers Come from Another World, Citadel, New York, 1956; Michel, Aime, Flying Saucers and the Straight-Line Mystery, S. G. Phillips, New York, 1958; Bowen, Charles, The Humanoids: FSR Special Edition No. 1, FSR, London, 1966; Vallee, Jacques, Computerized Catalog (N = 3073); Vallee, Jacques, Challenge to Science: The UFO Enigma, Henry Regnery, Chicago, 1966; Vallee, Jacques, Preliminary Catalog (N = 500), (in JVallee01); Vallee, Jacques, A Century of Landings (N = 923), (in JVallee04), Chicago, 1969; Schoenherr, Luis, Computerized Catalog (N = 3173). *Oct. 7, 1954 - Mr. Sebelli saw an object land in the village of Bompas, France shortly before midnight. He called his neighbors, and they observed the departure of the craft. (Sources: Aime Michel, Flying Saucers and the Straight Line Mystery, p. 146; Jacques Vallee, Passport to Magonia: A Century of Landings, p. 220, case # 210). [---] Agence France Presse (AFP) news release, France, 1954. 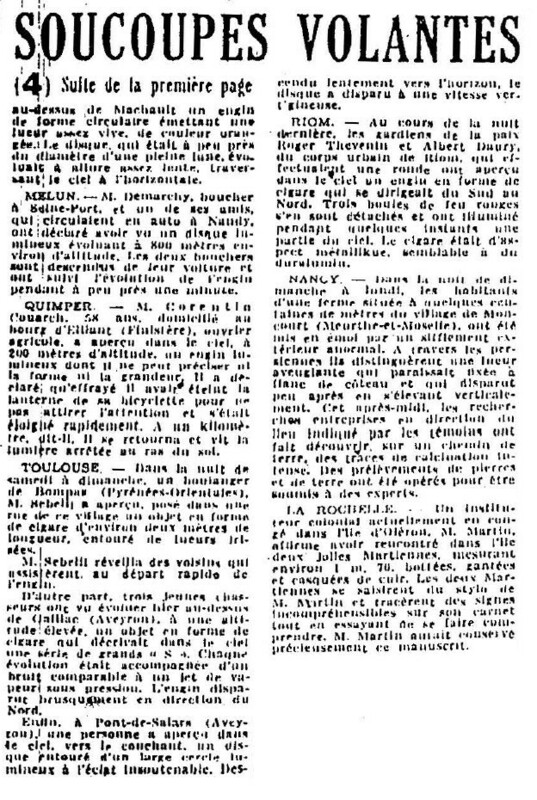 [---] Article in the national newspaper Paris-Presse, Paris, France, October 13, 1954. [---] "Black-Out sur les Soucoupes Volantes", livre par Jimmy Guieu, Fleuve Noir éditeur, France, 1956. [jg1] "Black-Out Sur Les Soucoupes Volantes", book by Jimmy Guieu, Omnium Littéraire publisher, France, page 206, 1972. [gl1] "Face aux Extra-Terrestres", book by Charles Garreau and Raymond Lavier, Delarge publisher, France, page 163, J'ai Lu, France, page 172, 1975. [am1] "Mystérieux Objets Célestes", book by Aimé Michel, Seghers publisher, France, page 199, 1977. [fr1] "OVNI - Premier Dossier Complet des Rencontres Rapprochées en France", book by Michel Figuet and Jean-Louis Ruchon, Alain Lefeuvre publisher, France, page 140, 1979. 0.1 Patrick Gross April 5, 2003 First published. 1.0 Patrick Gross May 1, 2009 Conversion from HTML to XHTML Strict. First formal version. Additions [fr1], [dj1], [jb1], [lc1], [ud1]. 1.3 Patrick Gross September 21, 2014 Additions [ha1], [ni1]. 1.4 Patrick Gross November 20, 2016. Additions [er1], [ub1]. 1.5 Patrick Gross December 19, 2016. Addition [lg1]. 1.6 Patrick Gross December 30, 2016 Addition [fs1].